The parish Reconciliation Service will be celebrated on Tuesday 30 March at 7:30 p.m. Like last year, readers for the Easter Triduum will have a preparation workshop afterwards. The Diocesan Chrism Mass is on at St. Patrick’s Cathedral on Wednesday 8 April at 7:30 p.m. All are invited to attend. Representatives will receive from Bishop Anthony the oils that our parish will use over the next twelve months in our sacramental celebrations. The Easter Triduum begins with the Holy Thursday Mass of the Lord’s Supper at 7:30 p.m. The Parish Centre is reserved on this evening as the altar of repose for the Blessed Sacrament. Please remember that entry that evening is via the church doors – if you cannot manage the stairs, please see our welcomers about using the ramp and parish centre entrance. Please bring your Project Compassion box with you also and place it in the basket near the church entrance. Stations of the Cross will be prayed on Good Friday at 9:00 a.m., and the Sacrament of Penance will follow from 9:30 – 10:30 a.m. The church will remain open during the day for those who wish to come and pray. The main celebration of this day is the Celebration of the Lord’s Passion at 3:00 p.m.
Like Holy Thursday and Good Friday, there is no morning Mass on Holy Saturday. If you have flowers to contribute to our adornment of the Marian Shrine or other saints, please bring these down to the parish centre from 9:00 a.m. – 10:00 a.m. The main celebration of this day and the entire Easter Triduum is The Easter Vigil at 7:30 p.m. Mass will begin with the Service of Light, which will commence in the Garfield St. car park, before we proceed behind the Paschal Candle into the church. 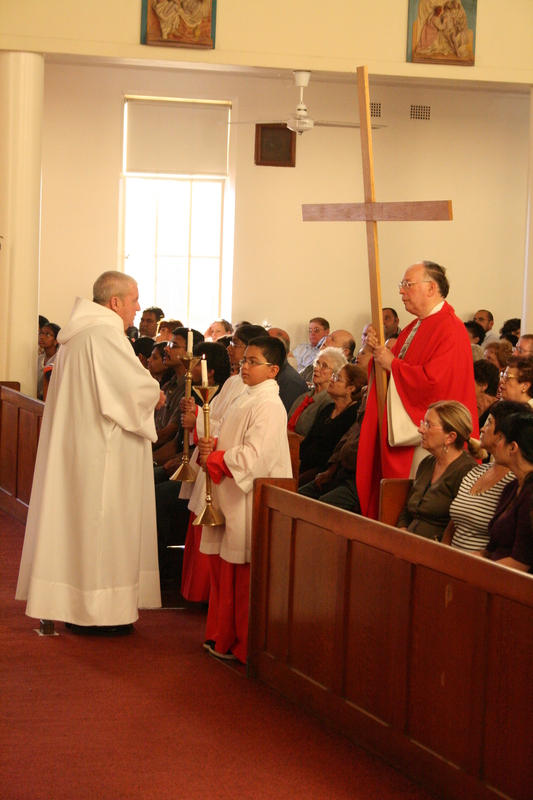 Finally, Easter Sunday Masses will be celebrated at 7:00 a.m., 9:00 a.m. and 10:30 a.m. only.